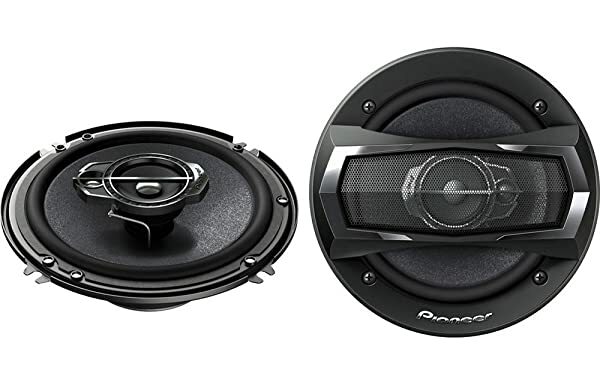 If you are looking for a new 6.5 car speaker, then you might be interested in reading this review about the Pioneer TS Series A1675R 3-Way Coaxial 6.5 Car Speakers. When listening to music, you need that kind of car speaker which can help you groove to the music. What is the point of playing music when your car speakers do not help your cause? The TS series comes with a 6-1/2″ A-Series 3-Way Coaxial Speakers, which are adequate enough for any type of vehicles. These speakers are able to reproduce the ambiance from where the original sounds come from. Perhaps, that is the best way to describe the car speakers. You can literally feel the music being played in front of you using the TS series three-way speakers. The 6.5 car speakers is a Pioneer built A-Series speakers that have been designed to help you to provide high-performance music. When you really want to feel the notes of musical instruments and the kind of music that is being played, then you need to something better than sub-par speakers. The Pioneer equipped car speakers are the TS-A1675R 6-1/2″ speakers. These come with multilayer mica-matrix woofers that are able to keep the distortionless sound enabling you to listen to the bass that is being played. The woofer is paired with a speaker that is mid range and a tweeter that provides some clarity to the soundtrack. The cone has multilayer mica matrix material that is strong to decrease the warping that happens when the song is being played. However, it is able to give you subtle mid-range noise that is smooth to hear. The soft dome tweeter consists of the Wave Guide technology that helps you increase the sensitivity. The mid-woofer and tweeter give you balanced sound within a very audible frequency range. You could say that you can listen to each note that is being played for the songs to which you are listening. These speakers can be attached using a head-unit or an amplifier. That makes them easy to install on any vehicle. This 3-way coaxial speaker comes with a 300 watts maximum power (50 Watts Nominal). That is really sufficient even for the best of car speakers. The new multilayer mica matrix cone has been designed to offer you with optimum sound and response. When you are listening to rock music or sound of that kind you would want the car speakers to kick in to give you that high, otherwise what is the point of having car speakers. The power is handled well with the peak at 300 watts per pair / 150 watts each and the RMS at 100 watts per pair / 50 watts each. The speakers come with a cone material that is made from multilayer mica matrix. The speaker surround is made from elastic polymer. The tweeters are made from soft dome tweeters that come along with waveguide for increased sensitivity. This helps in getting clear music for the ears. There is also a high-temperature voice coil and 4 ohms impedance. The grilles protect the speaker from damage. The frequency response is between 35-31,000 Hz, which is pretty decent. The top-mount depth is 1-3/4″ which is not really too high, and the sensitivity is 90dB, which is bearable. The car speakers are extremely simple to install. You do not have to be a car mechanic to do it. However, if you feel you are not confident of getting it done by yourself then please make sure you get the help of a professional electrician. The speakers are simple to maintain. You just have to ensure that they are installed properly and keep your car clean to avoid dust getting inside. They are quality speakers and provide you with the ultimate sound effect. Certain songs really need the sound effect to get you the feeling and groove. These speakers can help you feel the power of certain songs. The product is very durable and can last you for several years if used carefully. Since they are speakers, you just need to make sure that the electronic system in your car is in good working condition. The speakers look nice. Though there is not much really to say about car speakers, these come with a classic round shape, and a cylindrical object placed above the speakers that give it an elegant appearance. The bass is quite poor. If you are a person who enjoys bass, then you may be left disappointed. Several users have raised the issue of the bass being inaudible. The overall sound quality needs to be improved to give you the satisfaction. The Pioneer TS series has got a lot of respect in the market. Its rankings and ratings speak for themselves. It is the number one seller of Car Surface-mounted Speakers on Amazon. The product has got 4.6 out of 5 stars rating and more than 700 customer reviews on Amazon. That itself shows the popularity of the car speakers. It is safe to say that the Pioneer TS Series A1675R 3-Way Coaxial 6.5 Car Speakers are one of the best 6.5 car speakers 2015 you can find in the market. The Pioneer system has powerful features that make it ideal for just about any car make. Though you may face minor issues when your electronic car system is not compactable with them, there is no reason for you to feel disappointed. The speaker system is economically priced to meet your budget requirements. There are always a possibility of have special discount rates with Amazon. So make sure to check Amazon to know the latest prevailing price and special discounts. The discount structure will be keep on changing. If you own a vehicle that is older than a decade, then you might want to reconsider the car speakers as they may not give you the desired effect. Apart from that, this is a great buy. Whether your car is small or large, you know that the 6-1/2” speakers should be enough. Before installing them, you will want to make sure that you consult with a good car mechanic or someone who has good knowledge of car speakers and car make.